The Austin A40 was a compact sedan designed to handle British post-war roads, but also to conquer markets abroad with its record-breaking (according to period advertising) 42bhp OHV engine. Shown together with responsible, pipe-smoking family men, listed at £467, it was a rather frumpy-looking thing, designed to be durable, and considered to have respectable acceleration for the time. However, handling was not impressive, and 42bhp probably didn’t conquer much more than the odd 2CV or Fiat 500. Nonetheless, there is something kind of fun about the bulbous styling of this A40, so what can we do to make it more fun? 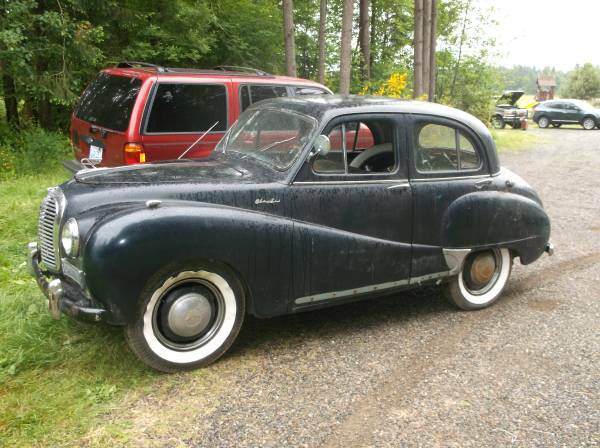 Check out this 1954 Austin A40 Somerset for sale for $2500 in Seattle, WA. For a while there, it must have looked like the A40 would conquer the foreign market, as there are quite a few roached out examples in North America. Among those, today’s car is one of the better ones – it seems more or less complete, has a running engine, and is up on all four tires. 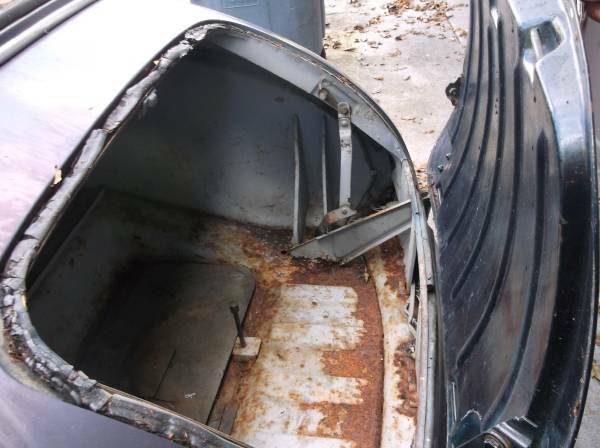 There is some rust, though it’s described by the seller to be minimal. Here’s the lump – not much to write home about, but enough to use while you develop the car. So what to do with a decent-but-not-perfect older sedan that has not much value?. Well, the whole gasser thing has been overdone on compact European cars of that era, and while adding contemporary wheels and a modern velour interior has been done, that’s not to say it’ll be fun to drive or nice to look at. So let’s think period competition – you’ll have to throw historical accuracy out of the window, as it appears these were not raced a lot, if at all, but picture this old thing riding slightly lower on some dished steel wheels, with numbers on the doors. Use other saloon racing cars as a model for equipment like seats. 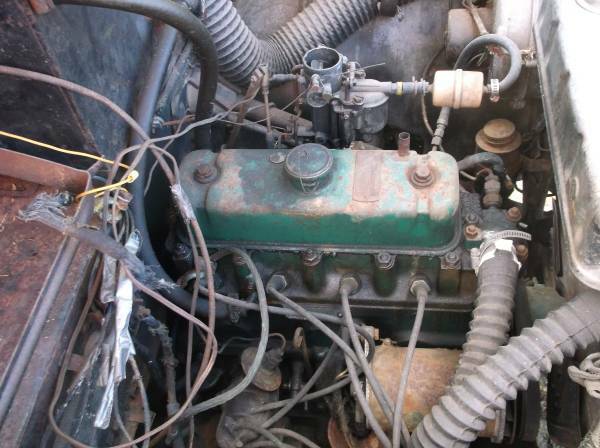 And for the powertrain… well, once you get there, how about a B-series, or a Datsun or Pinto engine? No doubt one of those has been done before. 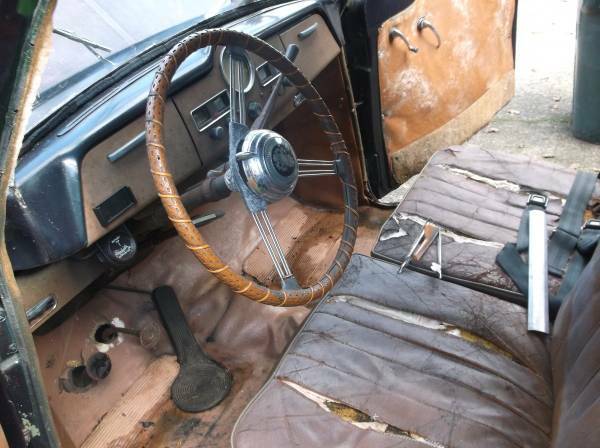 And here you can see why the interior will have to go. The original leather is falling apart, and the padding inside is no better off. The door panels are moldy and warped, so why bother replacing them? Perhaps a simple sheet of fiber board covered in vinyl with door pulls would create the right feeling. Room for tires? You’ll get four with the car, although the whitewalls don’t suit the saloon car vibe. Tape over the headlights, add a side exit exhaust, maybe add a period spotlight to the front bumper, and you’ll look and sound ready for the races. Even if you’re not. This entry was posted on March 8, 2015 at 10:36 pm and is filed under Feature. You can follow any responses to this entry through the RSS 2.0 feed. You can leave a response, or trackback from your own site. Gassers are overdone and just plain silly – get the poor thing up to where it was originally with a minor addition or two and leave it alone. You can’t find a decent 30s coupe of any make anymore because they were all turned into overblown, sleazy, cheap-looking hotrods, so why do it here? Leave the 42 hp 1.2 litre engine as it is, change the differential to one from an early Austin-Healey 100-4 (it bolts right in) which will push the top speed to a bit over 80, and it’ll be a nifty little highway cruiser with 50s looks that will get 30 mpg. That’s rarer than any garish galumphing gasser and a lot more elegant and useful.